If you could sum up Bright Line Eating in three words, what would they be? I can't speak to highly about this book. I have read the book three times now up to the chapter on maintenance. I will read it again. I get something new out of it every time. First, Susan Peirce Thompson tells why we have so much trouble losing weight - she gives the underlying reasons of what is going on in the brain. I now understand why, in the pastt, I have eaten a large serving of ice cream before I even knew what was goin on and still craved more. She also explains why I can manage to eat very well until 2 pm and then I lose it in the will power department. And, she explains even more. Just understanding these things helped. After that, she writes about the bright lines and why we cannot cross them. One is no sugar; in fact, no sweeteners whether they have calories or not. Somehow, I have known for a long time that I would have to comply with this one, but I was never able to do it. I have been on several diets with no success. Weight Watchers three times! I paid a lot of money and went to the meetings where I could buy those sweet treats with low points, the ones you could have occasionally. But, I would go home and eat them all and then feel awful because I had no self control. If this sounds familiar, you must read this book. She also gives complete advice on how to start and how to handle difficult situations. With every other diet, I was always waiting for the day I could have some ice cream. I don't do that now. I know I can never eat ice cream and I am really ok with that. There is no magic bullet, no special food you can eat and no special vitamin you can take to make the journey easier. But, you will have the really useful tools to help you shed the weight and keep it off. Over the past two years, I have read over twenty books on diet. I can honestly say this is the place to begin. I have low vision and it has been a struggle to write this. It was just too important. I had to do it. Wow. Just wow. This book is a game-changer. What made the experience of listening to Bright Line Eating the most enjoyable? This book. THIS BOOK! Wow. It's a game-changer. It changes everything. 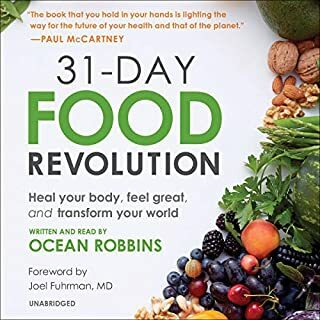 Not only is Susan Peirce Thompson's approach to getting control of your food and your weight powerful and compelling and based on brain science, she also presents it in a clear, convincing, wonderfully readable way. Hearing her narrate her book is especially powerful -- I strongly recommend the book overall, but I particularly recommend the audio version. Thompson overturns so much -- so much! -- of what is standard, unquestioned, deeply ingrained thinking about weight loss (the old canards like "you can eat anything, just in moderation," "exercise promotes weight loss," "sugar, eaten in moderation, can be part of a healthy diet.") No, no, and no. At least, not for the majority of us. In her compelling argument, people struggling with their weight aren't lazy or lacking in willpower. They don't need to just get off their lazy butts and get to the gym. They don't need to just stop eating so much. No. Their brains have been high-jacked. And the substances doing the high-jacking are NOT fat, salt, or simply an excessive consumption of calories. The substances are sugar and flour. Period. Fat people aren't sloths -- their brains are addicted to these substances and practicing moderation can be as much a no-win solution as practicing moderation in drug use would be to a brain addicted to heroin. What was one of the most memorable moments of Bright Line Eating? There are two things I especially love about Thompson's approach. One, that it's based on science. She's not guessing here. She's not making things up based on what seems logical and reasonable. She's looking at the science. And what the science suggests is pretty persuasive: Sugar is addictive to your brain. And flour might very well be too. We live in a toxic food environment where sugar and flour are everywhere and in everything. As with other addictions (in varying ways depending on your own brain susceptibility), the way forward is to remove these substances from your diet. The bright lines are simple, clear, and unambiguous: no sugar, no flour, three meals a day, and weighing all your food. The second thing I love is that her style is so wonderfully loving, supportive, and inspiring. Thompson writes in a way that is never condescending or dryly scientific. She tells stories, she shares her own experiences, she makes academic scientific studies easily comprehensible. But hearing her read her own book is incredible. Her warmth and love and understanding shine through her voice as well as her writing. Writing this way is not easy to do -- and speaking this way is even harder. I am wildly impressed at her ability to do this. My only singular concern, which she does address, is that for all that this approach is simple, it's not easy. It's no easier than quitting cigarettes would be for a cigarette addict. Or quitting alcohol for an alcoholic. This is hard to do. And she does say so, when she notes that (I'm paraphrasing here), if a food plan is all it took to lose weight, everyone who wanted to get thin would be thin. 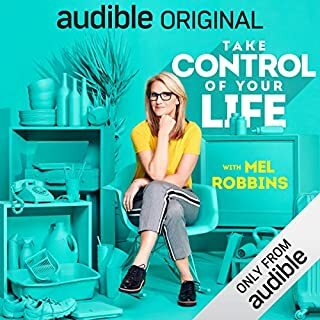 Still, I worry that readers might fall in love with her wonderfully supportive, upbeat tone in the audiobook and think that simply deciding to follow the bright lines is all it takes. Make no mistake, this is hard to do, and it requires a TON of support and self-love-and structure and help (the bright-line eating approach provides that, but you have to be diligent about seeking it out and getting it). This is Thompson's first audio book performance, but having listened to her videos online, I found her ability to read text as strong as her ability to speak without a text in front of her. In this audiobook, it sounds like she's just talking to you in a personal conversation. Nothing sing-songy or monotone. She's great. I listened to this book while on a drive that lasted 5 hours. And I wanted it to be longer so that I could keep going. The information in it is that good, and Susan's narration is that wonderful. It's not often that a book comes along that has the potential to cause a seismic shift in our thinking, but this book does that. 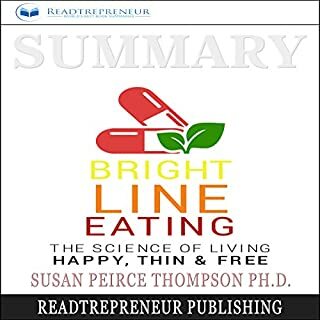 Bright Line Eating should have as profound an impact on our thinking about weight loss and the obesity epidemic as Rachel Carson's Silent Spring had on our thinking about pesticides and the environmental movement. 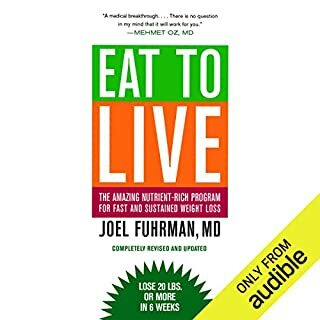 I really hope that everyone struggling with weight and food issues, whether they have a modest problem or a serious food challenge, gives themselves the tremendous gift of reading this book. I worry that I'm going to sound like some nut-case, over-the-top Susan Peirce Thompson fanatic. But it's really true. Bright Line Eating has changed my life. Like so many other reviewers, all I can say is thank you thank you thank you Susan Peirce Thompson. My deepest wish isn't that this book will help me (although I hope it does); my wish is that this book changes the world. FINALLY the program that actually WORKS! I went through the Bright Line Eating Boot Camp almost two years ago and finally got off all medications and down 86 lbs to goal weight. So I knew Susan's voice from the coaching calls and videos in the online program. The hardcover book is FABULOUS and my new nightstand read. But I wanted to hear Susan read it to me... Because we have so many food cues in our culture, and so many around me eat differently than I do now... I like to be reminded daily about the program that's keeping me feeling so FREE from all my former food cravings. So what I like best is hearing Susan. She is the real deal. She's walked this path, and she tells it like it is. The personal. The gritty. The science behind our brain chemistry. I can't say enough about how fabulous this book is... the audio, the hardcover... and the program you can join online. I was so afraid to EVEN TRY to go without sugar and flour. Now I'm on Day 658 and don't miss it at ALL! I like the combination of real science combined with personal stories. I like the love that went into every chapter. Mostly, I like that the food plan is one that healed my brain and now allows me to live in a right-sized body. I'm feeling my ribs and hip bones for the first time in my adult life. While the personal stories and case studies are deeply moving... I needed the science to understand why THIS plan would be the one that would work for me. Yes. And I'll also enjoy repeat listening. I can't express the degree of emotional, physical and spiritual suffering I had because I was morbidly obese. I felt hopeless and full of shame that I could not stop eating sometimes even when I didn't want to be eating. I never in a million years thought I'd be down 86 lbs and feeling better at 60 than I ever felt at 30. But it's true. And if I can do it, believe me, ANYONE can! I truly believe Susan might have found the answer to obesity. Having said that, this book is highly recommended not only as the way to lose weigh (and keep it off) BUT for the invaluable knowledge Susan shares. For example, the information of how the brain works, concepts of the susceptibility scale, the concept of brighlines in general, the automaticity concept, the willpower gap and the link between phycological issues and processed foods is priceless!! Highly recommended to anyone whether they have a food addiction, want to lose weight or want to follow the brightline movement. This is an excellent book! Would you consider the audio edition of Bright Line Eating to be better than the print version? Bright Line Eating is the program I've been looking for, for many years. Listening to Susan, I find better then just reading. Her magnetic personality comes shining through, and it inspires me. I've lost 40lbs on the program. I know listening to Susan's vlogs and I know I'm going to enjoy hearing this book over and over, because I still have some weight to loose but most importantly I know this is the way I'm going to maintain, once I've reached goal weight. Listen and/or read the book and I'm sure you'll find it as motivating, inspiring and doable as I do. What other book might you compare Bright Line Eating to and why? Susan talks about the science behind why our brains make us compulsively overeat. She explains how/why sugar and flour are so addictive, and then provides a viable solution for overcoming this addiction. It's as good as Dr. Robert Lustig book "Fat Chance: The Hidden Truth About Sugar, Obesity and Disease", but it's the program that is behind it that is the answer to my prayers. This book doesn't have any new ideas, however, it is packaged a little differently and I can see that resonating with people. The reason for my low rating for story was that about 25 percent of this book was the author trying to sell additional services, etc. and it had an infomercial feel to it. She also contradicts herself, such as saying how you stick to your bright lines to make decision making automatic, but then saying she doesn't know how long she will do this diet for, she could stop tomorrow. I feel there is also an over emphasis on being happy by doing this diet. There are a lot of overweight people with food addictions who are happy. Happy and thin or free from food addiction are not necessarily mutually exclusive. She does do a good job presenting the book. What did you love best about Bright Line Eating? I bow to Susan Peirce Thompson's focus, story and mind. Her tenacity to unravel the obesity mystery and support others through it is is of profound importance. As someone who's been doing BLE since 10/16 I can honestly say I have never felt so free. This book gives me the perfect gift to give everyone who has been asking me how I am doing so well. I have immense love, joy and gratitude for this work! If you have struggled for years with weight issues, this information is life changing. I was mostly curious to find ways to deal with emotional and boredom eating. This is not the ticket for that. This book is read well by the author and the science and foundational information is excellent and enjoyable. Avoiding sugar and flour while controlling portion sizes is excellent advice. I agree that the diet plan will certainly get people to lose weight, and the maintenance plan will maintain the weight loss. However, If I ever feel I must resort to this program, I will also consider it an enormous personal failure. The idea of weighing every morsel of food to the tenth of an ounce and bringing my own food to weddings and celebrations, (or worse, my food scale) - not because of religious or allergic restrictions, but because I cannot be trusted to take a bite without losing control of my eating is, frankly, a bridge I will not cross. I am glad this program helps some people and the book is worth checking out in case the reader is one of them. The interminable 'case studies' are hugely boring after the first couple and annoying to try to skip when listening in the car. They are mostly the same - 'tried everything, nothing worked, Bright Line eating worked and now my life is wonderful.' These are not case reports but personal testimonials and detract from the science the author otherwise presents. I felt the science alone was worth the listen even if the implementation of the plan is not for me. I was introduced to Susan Pierce Thompson and Bright Line Eating a year ago when my wife started one of the Bright Line Eating Bootcamps. I was seeing her great success with the plan and thought I would hop on board too. I had some weight to lose but wanted to get my cholesterol under control. The doctor wanted me to go on medication and I was trying various things but nothing would change the number much. Now, a few months later I am at the lowest weight of my adult life (I am 56). I actually weight about the same as I did in high school. I work out a few times a week and have some muscle weight so that accounts for a few extra pounds. The doctor is very pleased with my cholesterol numbers and I can avoid going on any medication. When I was given the chance to get an advanced copy of the book I was anxious to read it. I wanted to learning more about Susan's journey and her knowledge and research about the role that the brain plays in how and what we eat and how we can outsmart it. I can now say that I feel I can easily maintain my weight loss by following this plan. Best of all it is completely based on natural whole foods so I feel I am eating healthier than any time in my life. A MOST Entertaining, and Informative Diet Book! It was a big surprise that a book on weight loss would inspire me to submit a review. But after a lifetime of trying can't miss diet plans that ultimately backfired - sometimes with extra weight, it is nice to hear solid researched arguments that support a diet plan that has already been around for many years-12-Step Food Addiction programs-without the necessity of attending &quot;meetings&quot;. Counting Calories, eating small amounts often, the necessity of exercise while losing weight and many more approaches are not panaceas, and may end of doing more harm than good. Dr. Thompson tells us that Bright Lines are the answer to permanently losing weight. What are Bright Lines? They're the Rules that have been followed by 12-step food addiction programs that have enabled participants to lose weight successfully for many years now. Except, in this book, she explains why these &quot;Bright Lines&quot; work. To overpower cravings and excessive hunger, one has to permanently give up sugar, flour, alcoholic beverages, and stick to three meals, and weight/measure your food each day. You also need to write down what you're going to eat the day before (plan). Exercising while trying to lose weight depletes precious will-power which is necessary to adhere to these Rules in the beginning-so she encourages listeners not to exercise while losing weight. But, don't take my word for it, you need to hear the persuasive evidence based research pleasantly presented to you by a Brain Researcher and Former Drug Addict and Former 12-Stepper. She even has an EXTREMELY EXPENSIVE &quot;Boot Camp&quot; which you can access on line-as I did, and now regret (save your money), because the book and free on-line information is all you need! Who knew - a Diet PLAN book - written by a Community College Professor/Brain Researcher and Former Hard-core Drug Addict! You won't get bored! I follow this plan combined with the NO S Diet Plan which you can find online. It also has the 3-meal a day, NO Sugar rules, but allows deviation on Weekends. This works for me because sometimes when I go out with friends I want to be able to have a cocktail and eat what I want moderately &quot;without&quot; rules. For me, combining these two plans was the answer to losing weight and keeping it off without feeling deprived and it's a plan I can stick to. Dr. Thompson's mantra: If you go off the plan, RESUME. An excellently written book that will definitely keep your attention all the way through! Absolutely, I consider the audio edition of Bright Line Eating to be better than the print version because I can listen to the author's voice. The author, Susan Peirce Thompson, for her honesty and passion in reaching her dream to write a book that will help millions of people with their loss weight and addiction to food. The narrator is the author Susan Peirce Thompson and she is wonderful. She brings her own experience, warmth and enthusiasm in her performance. I waited for this book my whole life! I followed the method described in the book and in 9 months I dropped 5.8 stones going from size 20 and a BMI of 36.6 to size 10 and a BMI of 24. I will be forever grateful to Susan Peirce Thompson for her vision of writing a book about food addiction and about how to live Happy Thin and Free. She helped to get my life back. The audio format is great as I can listen to it anytime, anywhere and it's going to be part of my EAP. What is EAP? You have to listen to or read the book to find the answer. It's fascinating and in the same time so simple. The book represents a holistic approach to food addiction, based on the author's life experience, study and research. It contains amazing scientific information and neuroscience research presented in such an easy to understand manner by Susan Peirce Thompson and includes interesting study cases. The book describes a method that does not rely on willpower but on automaticity and integrity with food. The food plan is a simple, ingenious and reliable solution to gain and maintain the ideal weight. 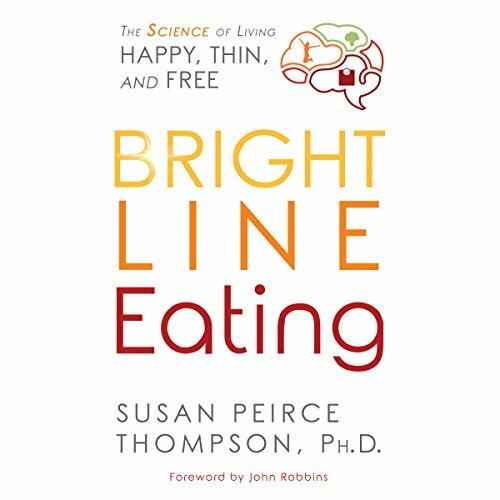 "Bright Line Eating: The Science of Living Happy, Thin & Free" may very well constitute "The Book" for anyone who wants to achieve a healthy eating style and break free from food obsession, simply following 4 Bright Lines, eating whole foods and learning about the inextricable link between our brain, body and soul. Where does Bright Line Eating rank among all the audiobooks you’ve listened to so far? Obviously Bright Line Eating is not a story but is still quite absorbing. I listened with interest to this slightly different way of thinking about food. As with all weight loss books, the only thing that matters is did I lose weight? Well yes in the past two weeks of following Susan Peirce Thompson's rules I have lost 6lbs. I didn't find it hard to follow. (I had already lost 8lbs in the previous 4 weeks). What other book might you compare Bright Line Eating to, and why? Never Binge Again by Glenn Livingston has a similar thinking behind it. The author narrates the book and I think it's her first. She's very American (being an American!). Might grate against some Brits but I find it OK. She is a very prolific You Tuber so I often have her wittering away in the background whilst I work and have got used to it! Like all self help books, you have to take from it the bits that will serve you and let go of the bits that are of no interest (I'm not a great one for meditating or journalling but I'm not marking the book down because the author goes on a bit about those practices because that advice might be useful to someone else). It is a shame that the app which is not yet launched is mentioned so often, that gets a bit irritating. Also clearly diets and coaching are big business so the whole book does feel a bit like a marketing tool sometimes. Still - I'm losing weight so....... pretty much everything else is forgiven. I got 2 hours into this book before being directed to go to their website and fill out a quiz which is very much phrased to skew the results that the author wants, in order to plug her paid subscription boot camp. Not too much substance to be found here, however, as another reviewer said, there are a few bits of information that may be useful to some but those could easily have been condensed down into a 15-20 minute audiobook....definitely not necessary for it to be padded out to 7 hours. I also disagreed on several claims the author makes which are fundamentally incorrect. For example the author boldly claims that there is no correlation between exercise and weight loss, and suggests that science has proven that flour is more addictive than heroin or cocaine. I was expecting more facts and less advertising, the diet is basically don't eat flour or sugar , ever and only eat at certain times with no snacking ever. I don't think the bright line way constitutes a 'happy' or 'free' diet as advertised. I loved the mini-reviews / sections where people discussed their experiences of the diet - and she has some big claims on its effectiveness... but cutting out flour and sugar completely? Just unrealistic. I don't hate being overweight enough to give myself that level of stress every time I go shopping/have something to eat. The principle of just 'never do it' (i.e. you don't stop yourself having lung cancer by smoking slightly fewer cigarettes) makes perfect sense. But in reality that means only eating veg, fruit, meat and fish - I just can't imagine anyone being able to sustain that long term with the amount of time that would require to prepare - even vegans have a rice cake every now and again. Sorry to rant on this specific book, but I am tired of the growing trend in "self help" books of writing 50% of the book as an introduction, and most of them about the personal history of the author, telling us how great their idea is without actually explaining their solution at all. We don't care about you: if you have something to say, say it in the first chapter. These kind of books, including this one, feel like a commercial plug to other services. The main message of the book could have condensed in one single page, and saved us from hours of useless anecdotal evidence or personal journeys. Ok book. All the information comes from overeaters anonymous which the author freely admits. Happy, thin and free is the promise but very strict on foods, amounts and timing of meals. Not sure that the happy and free apply, but maybe the thin if you have a strong enough will. This plan seems good in principle but impossible to follow using an audio book. After introductory chapters there are many lists which cannot be followed on audio. I returned the audio and bought the physical book - from Amazon of course! The author claims a huge breakthrough in weight loss and sustaining it. Basically to not eat sugar or flour...ever. This book is one big upsell to her products and services for the bright line eating regime. Did you know your brain blocks weight loss! Basically this method involves following an extremely strict diet plan (measured and weighed food, 3 meals only per day, no sugar or flour). These are your 'bright lines' that you need to follow long enough until it becomes a habit. Requires MASSIVE amounts of motivation, self control and discipline to be successful. If you are a very disciplined person this may work for you. I'm glad it worked for the author and those who gave testimonies in the book. If you have ever struggled with food & weight, just read this book. Now. Brilliant & life changing. This book is thought provoking. I personally cannot agree with or implement all of the good advice that is contained in this book. Nevertheless, I feel it is an important discussion to have and I am very grateful for it. I recommend it to anyone who wants to lose weight. This book is fantastic! if you want to lose your weight and be in your right sized body for the rest of your life then Bright Line Eating is the answer. Susan Pierce Thompson explains why you have not been able to do this in the past and then goes through the steps of how to be successful in your weight loss and maintain it for the rest of your life. Do yourself a favour and listen to this audio book or buy the printed book and it will be the best thing you have ever done. Was hoping the psychological side of this book would be more comprehensive, it is however, very light on. The diet is a pretty much a standard bodybuilding diet. For someone with zero knowledge of nutrition & very overweight, it would probably be useful, nothing that couldn't be found in a 2 minute google search tho. Disappointing. 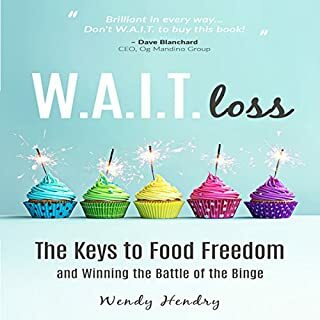 This book deals with the serious issue of food addiction and the solution is to restrict for life both food and portions. It does make sense and someone following the very low calorie plan will lose weight but the actual outworking of this program would requires some serious inner strength especially for someone with disordered eating. I loved the detail, the personal stories and Susan’s willingness to be authentic and share such intimate details of her journey. This book was simply Life Changing! Food junkies is probably a very apt description & an enlightening concept. . . .